Built Heritage – How can we help you? Single Membership by Annual Renewal at £30. UAH Looks Back on 2018! UAH and IGS Summer School: FREE Student Scholarships! *EXTENDED* Invitation to Tender: Lead Consultant, Old Museum Building: Back to Life Project. Old Museum Building: Back to Life. Be Part of It! President Primrose Wilson Awarded Honorary Membership of RIAI. BREAKING: Foyle Civic Trust & Walled City Partnership WIN Overall UK Heritage Angel Award UK! Heritage Half Term. Bake A Building ~ The Big Building Bake Off. UAH Success in Reversing Flawed Planning Decision. UAH Challenges Conservation Area Demolition Approval. Northern Ireland’s 2018 Heritage Angel Awards Shortlist Announced! Launch of Bake A Building 2018. Belfast’s Bank Buildings: Ten days on and still no plan. Blaze at Historic Bank Buildings. Blaze at Historic Builder’s Yard, Another Bulldozed Building. Launch of ‘Built Heritage – How can we help you?’ survey! Heritage Angel Awards: Deadline Extended! Waterside Station Approval: UAH requests ‘Call In’. BBC backs Belfast’s Built Heritage in Broadcasting House Restoration Plans. Planning Chaos? Who Owns Belfast? ‘Massive Monolith’ threatens to overshadow some of Belfast’s best historic architecture. PETITION: UAH Calls for Automatic Interim Protection to buildings in NI proposed for listing. Straid Congregational Church: Nearly Listed, Nearly Demolished- Now Saved! Waterside Plans – A Missed Opportunity for Derry. New book ‘Glamour and Gloom’ launches in time for Christmas! Fire – A Foe of Belfast’s Built Heritage. Heritage Angel Awards- Shortlist Announced! Application Submitted for Phase 1: Belfast’s Cathedral Quarter. New Listings-New Dawn for Protection of Built Heritage in Belfast? Seacoast Cottage Shines Light on Cuts to Historic Environment Funding. Belfast’s Next 15 Years? UAHS Responds to Proposed Plans. UAHS~IGS Summer School-Returns June 2017! Wiping the Face from Historic Belfast. Listed Bank Suffers Damage in Latest North Street Demolition. UAHS Announces Move to Old Museum Building! Listing Survey Years Behind Schedule. Heritage of North Belfast: Nearly Listed, Now Lost. New UAHS Publication on Young & MacKenzie- A Transformational Provincial Practice 1850-1960. UAHS Invites Members to Upcoming EGM. New Your Architecture, Your Heritage workshops for the Autumn! Ewart’s Warehouse, Belfast. Concerns Remain Following Approval. Unenforced Neglect Threatens Holywood Listed Building. Have Your Say! Consultation on Conservation of Churches. Ewart’s Warehouse: No to Demolition. Listed Courthouse Closures- A Call for Care. Current Northside Plans Deemed Refused. UAHS Survey: Have Your Say! More Demolition Proposed for North Belfast. Report released on Protection of Built Heritage in NI. UAHS supports proposals to list WWII hangars in Derry. UAHS celebrates launch of latest publication: Central Belfast, 2nd Edition. UAHS condemns the demolition of Art Deco Buildings in Belfast. 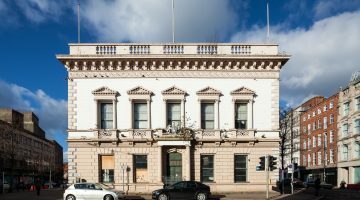 UAHS calls for a heritage led future for Bank of Ireland, Belfast. UAHS and Hearth at European Heritage Open Days 2015! Fire at Crumlin Road Court House, Belfast. UAHS Chairman David J Johnston Awarded OBE! UAHS speaks out about de-listing in Belfast. DoE Budget Cuts Threaten Scottish Mutual Project. UAHS has Joint Meeting with the Irish Georgian Society, IGS.